It�s times like this when I wish I had a cat that I could kick. The defeat by Chelski in yesterday�s League Cup final hurt so much that this old hack seriously considered leaping from the nearest window (then I remembered, I live in a bungalow). It was a bit like watching Madonna crash to the floor. And like Madonna, Spurs must pick themselves up, dust themselves off and start all over again. Well, Europe has disappeared before our eyes for another season, the League Cup is decorating the Stamford Bridge trophy room and we have slipped to a dodgy-looking seventh in the Premier League. The only good news is that we get our Thursdays back. I am thinking of suing Tottenham for making me old before my time. Over the years they have broken so many promises that I feel like a bride continually left at the altar. And I know where I would like to shove my bouquet. Are you listening Mr Levy? We cannot blame you for yesterday�s defeat. The football gods hissed down on Spurs and seemed determined to make the best team on the day finish empty handed and broken hearted. But what we CAN blame you for is not supporting Mauricio Pochettino in the last two transfer windows. He has performed wonders with players that he has inherited, without once being able to pick a team that he has bought. There is a nucleus of an excellent, young side being groomed at White Hart Lane, but Mauricio must be allowed to bring in his own choice of players to make his philosophy work. That will mean a clear out this summer, with the likes of Bobby �No Goals� Soldado, Erik �Showpony� Lamela and Emmanuel �Mr Moody Boots� Adebayor shown the door to help finance the Pochettino Plan. The final shots had hardly been fired yesterday when many Spurs fans spitefully turned their guns on Pochettino and several of the players. For the life of me, I can never ever understand how Spurs supporters can continually knock Spurs footballers. Constructive criticism I can accept, but some of the vile stuff is completely out of order. Yet the fans that made it to Wembley were incredible, and continually out-sung and out-shouted the Chelsea choir even after the second goal had fluked its way into the net. That�s the way to support the team, not with snide remarks on line that are undignified and unwarranted. Let�s give Chelski credit for well-planned, stifling tactics, and admit that � like him or loathe him � John Terry is one heck of a warrior who you would want alongside you in the trenches. There is a lot of muscle to go with the method in this Chelsea side, and we have to bow the knee to Jose Mourinho for getting the balance right. It�s no good pussyfooting around if you want to be winners. Jose was generous in his praise of Pochettino, and I for one have great faith in the Argentine coach both as a tactician and as a motivator. He will know the players who can make his exciting but risky high back line pressing game work, and he deserves the chance to raid the Tottenham treasure chest to bring them in. Let�s go flat out for a highly unlikely fourth-place finish, but accept that we must wait until next season for Pochettino to produce a side that can at last bring silverware to the table. Please forgive me for an unashamed plug for my 99th book that is about to be published. It has nothing to do with football but may appeal to those of you who like to read about great champions. And they don�t come greater than Muhammad Ali, The Greatest. 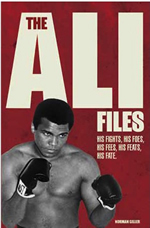 The book is called The Ali Files, and gives you a ringside seat at every one of his 61 fights against 54 opponents. Spurs and White Hart Lane have long had links with heavyweight boxing. Jack Solomons promoted British title fights there in the 1940s and became honorary President of the Spurs Supporters� Club, and of course Frank Bruno blasted Joe Bugner to an eighth round defeat at the Lane in 1987. I have chosen Ali as the subject for my 99th book because he is the most dynamic personality I have met in my 55-plus years scratching a living as a sportswriter. 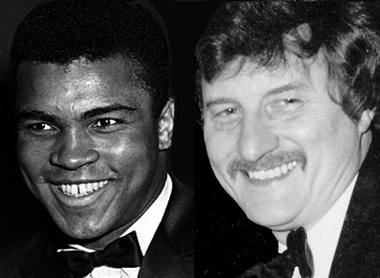 Lucky me, I've been in the company of many of the finest sports champions of post-war times, and Ali stands head and shoulders above them all as the most interesting and entertaining. We are pictured here in the summertime of our lives, when Ali was king of the world and I was observing from close range the life and times of The Greatest. Most things I read about Ali are by people who never saw him fight or got round to meeting him. I had the privilege of working in his PR team for several of his European fights and got to know him as a friend as well as a fighter. It has been heartbreaking to watch his health problems gradually worsening, but he has never once sought sympathy and is content with all he has achieved. To give the fully illustrated book a fascinating twist, I reveal what has happened to each of Ali's opponents since they took on The Greatest. You will be surprised, often shocked, by some of the revelations. There is a blow-by-blow report on every one of his fights, plus eyewitness accounts from experts and what was said at the time by Ali and his opponents. By ordering the book direct from me, you will get it at a saving of �3.99 from the retail price. The book gives the facts behind the Ali fable. I will send a personal email to everybody who buys the book from me, and I will willingly answer any questions you have about Ali � simply The Greatest. If you like your boxing, you'll love THE ALI FILES. To get us back on a football note let me tell you a quick Ali anecdote. He was in London training for his world title defence against Blackpool rock Brian London in the summer of 1966 and was invited along to watch the World Cup final at the Wembley ground where he had got off the canvas to beat Henry Cooper in the fifth round three years earlier. He sat alongside me at the back of the Wembley press box and I was witness to the fact that he slept through virtually the entire match. It was the only time I ever saw Ali out for the count. We are now into our NINTH week of the League, and there is still no sign of anybody breaking away from the leading bunch. Many of you are on a maximum 38 points, but don�t worry because there will be a tiebreaker introduced later in the season. Most of you were again correct with the answers to last week�s questions: For three points, who was manager when Spurs last won the League Cup? And for a one-point bonus, who scored for Tottenham from the penalty spot in the final? Yes, it was Juande Ramos, and Dimitar Berbatov scored the penalty that took the game into extra-time and the snatched winner from Jonathan Woodgate. How we were all hoping for a repeat yesterday! First name drawn from the senders of the correct answers is Ian Faulkner of Whetstone, London N20. He is now 60 and has been supporting the mighty Spurs since he was seven. I will be emailing him a screen version of my Bill Nicholson Revisited book. This week�s challenge is triggered by Wednesday�s Premier League match against Swansea at the Lane: For an easy three points, which member of the Double team joined Spurs from Swansea, and for a bonus point: what number shirt did he wear at Wembley for the 1967 FA Cup final? Email your answers please to SOQL9@normangillerbooks.com Add your name, the district where you live and how long you�ve supported Spurs. I will do my best to respond.